There was a change of guard at the 2015 Paris World Championships. 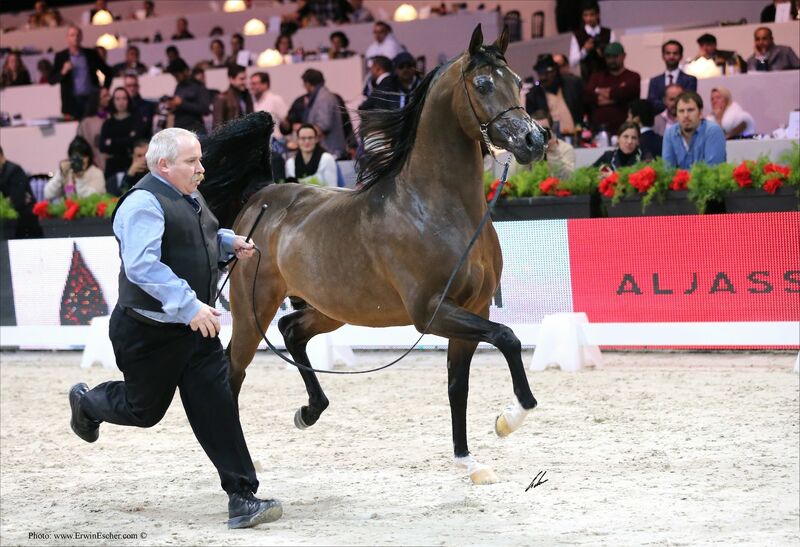 There was a change of guard at the 2015 Paris World Championships as Marwan Al Shaqab (Gazal Al Shaqab x Little Liza Fame), Leading Sire of the Show for many years now, was replaced by his son, QR Marc. It was QR Marc’s owners, the Gheysens family from Belgium, that stepped into the spotlight to claim this coveted award as progeny from this great stallion secured him the Leading Sire honour. Meanwhile, his vibrant son, Equiborn, took his second Silver World Championship title, more than proving that he is waiting in the wings and ready to follow in his great sire’s footsteps. 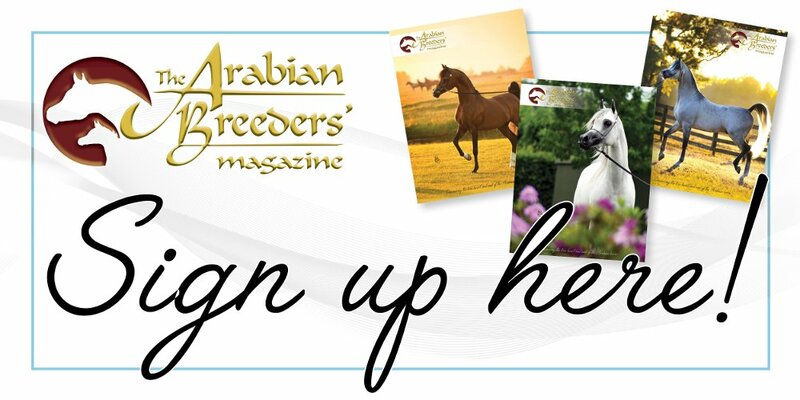 In this special edition of The Arabian Magazine, I look at these two amazing stallions. The QR Marc story is one that has been told well, and told often, through the pages of this magazine. This 2005 stallion is one that has consistently impressed me over the years and he has proved himself time and time again, both in the show-ring and as a sire. For Marc to take the Leading Sire Award at the Paris World Championships was a special moment for not only Paul and Ria Gheysens, owners of QR Marc and Knocke Arabians, but for everyone involved with this special horse. First, a potted history of Marc’s story: bred in the US by Vicki and Lou Doyle from Quail Ridge Arabians, QR Marc is sired by three-time World Champion Marwan Al Shaqab (Gazal Al Shaqab x Little Liza Fame by Fame VF out of Katahza) and is out of Swete Dreams (Magic Dream x Kouream de Ment by Kouros out of Rawhides Amenda). Purchased as a foal by Rohara Arabians, QR Marc took both the Unanimous Region 14 Sweepstakes Yearling Colt and the US Nationals Reserve Champion Breeders Sweepstakes Colt titles in 2006. The following year, Paul first saw QR Marc and, recognising his potential, and purchased him and brought him to Europe where he became the chief sire at Knocke Arabians. His first show for the stud was the 2008 inaugural Al Khalediah Arabian Horse Festival, now the Prince Sultan bin Abdulaziz International Arabian Horse Festival, and he won his class with ease before taking the Gold Junior Male Championship in some style. Marc’s focus was then on the breeding barn and there he excelled, which I will cover shortly. In 2012, Marc entered his crowning year as he won Gold at every show that he went to – the Abu Dhabi International Arabian Horse Show, the Dubai International Arabian Horse Show, the All Nations’ Cup and, having been Reserve World Champion as both a junior and a senior, Marc then achieved the highest accolade of all as he was garlanded World Champion Stallion. Equator was also a class winner in Paris last year. Those watching the show then should have known that it would only be a matter of time before QR Marc was named Leading Sire in Paris. That same year he went Gold, his progeny also proved themselves. Wieza Mocy (ex Wieza Marzen by Ekstern out of Wiazma by Arbil) took the Gold Junior Female World Championship, having already taken the European Championship earlier that year. She has since gone on to sweep all before her in the United States, winning in Scottsdale, Las Vegas and the US Nationals. In the Junior Male Championship, Equator (ex Ekliptyka by Ekstern out of Ekspozycja by Eukaliptus) took the Silver title, having been Bronze Champion in 2011. He, too, has gone on to shine, and is now on lease to Aljassimya Farm of Qatar, but located in the United States. Across the 2012 Junior Championships, QR Marc sired five of the World Top Tens including Knocke Arabians’ own Emerson KA (ex Elerina by Ekstern out of Emantka by Eukaliptus), Orfa D’Arab KA (ex OSO Axotica by Monogramm out of Algoda by Gokart) and Espressivo (ex Emocja by Monogramm out of Emigracja by Palas). Indeed, the intent for QR Marc’s abilities as a leading sire had been evident in Poland for many years. In 2010, the first progeny made their way into the show-ring and took home three titles. Zigi Zana (ex Zagrobla by Monogramm out of Zguba by Enrilo) was named Poland Gold Junior Female Champion; in 2013, she would be named Silver Senior Female Champion. Also in 2010, Piacenza (ex Primawera by Emigrant out of Premiera by Piechur) stood Bronze Junior Female Champion and Pogrom (ex Petla by Visbaden out of Petra by Pepton) took the Silver Junior Male Championship. He would go on to attain Gold Junior Male Champion in 2011 before going to the US. 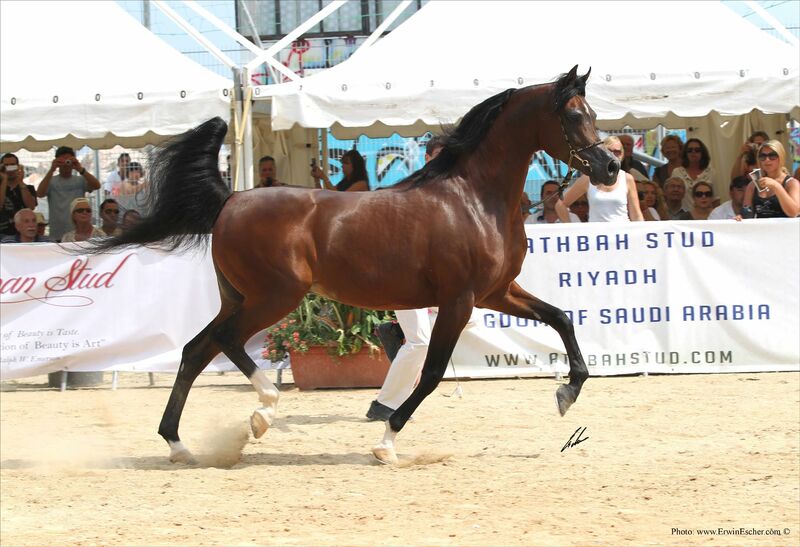 There, he achieved a host of titles, including the Gold Senior Male crown at the Arabian Breeders’ World Cup. Returning to Poland, he took the Silver Senior Male title in 2014. These horses, as well as those mentioned before, represent just a few of Marc’s success in Poland and it is noteworthy that between 2010 and 2014, QR Marc progeny took 16 champion titles at the Polish National Show. 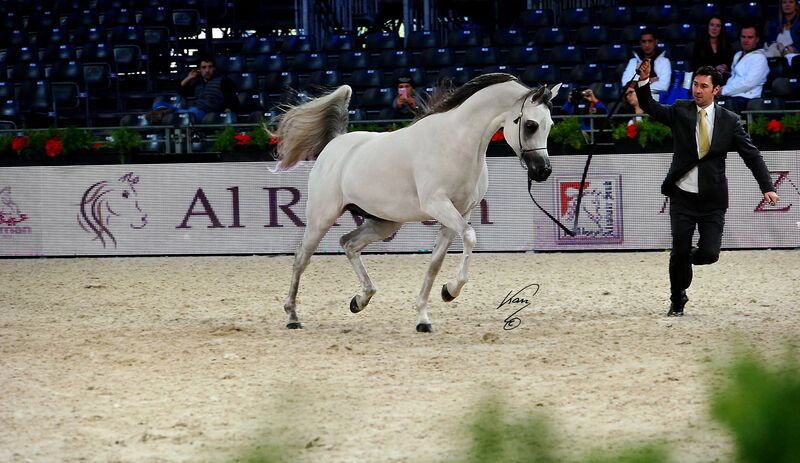 Orfa D’Arab KA won her class at the 2015 Paris World Championships and was named Best Moving Mare. However, those that follow the showing results know that the Polish QR Marc progeny represent just a small amount of his success as a sire. 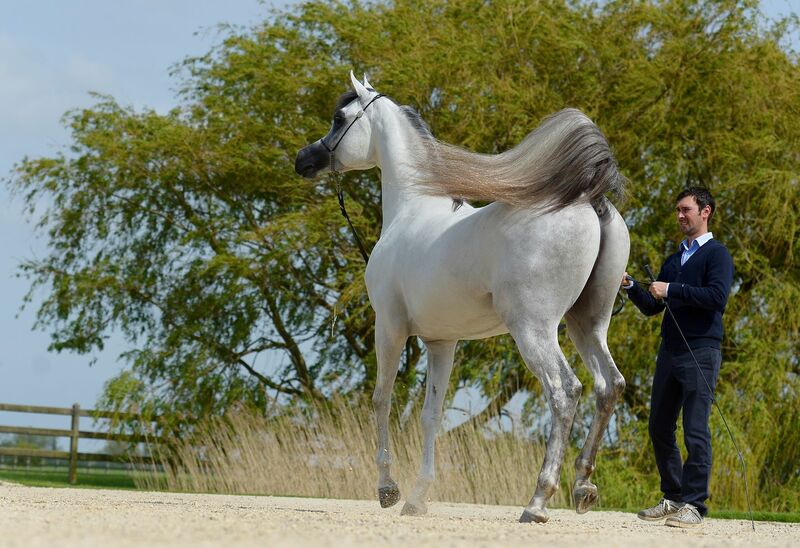 Rohara Arabians in the US have had continued success with their QR Marc sons and daughters but it is at Knocke Arabians itself where so many of the great show-ring winners in Europe can be found. From among Marc’s first foal crop for the farm was the 2009 stallion, Espressivo (ex Emocja by Monogramm out of Emigracja by Palas). I have loved this stallion since he was a foal, and he truly is a look-alike version of his sire. His titles include Reserve Junior Male Champion at Al Khalediah Arabian Horse Festival. Espressivo is now proving his worth as a sire and he remains one of Marc’s most charismatic progeny. Also from that first foal crop was the feminine grey filly Gazella (ex Greta by Pesal out of Girlanda by Eukaliptus), Gold Junior Female Championship at the 2012 Citti di Salena Show in Italy. The flamboyant grey stallion Panthos KA (ex Palanga by Ekstern out of Panika by Eukaliptus), Silver Junior Male Champion title at the 2012 West Coast Cup, was also foaled in 2009. The cross of QR Marc with FS Magnums Madonna (Magnum Psyche x Tai Bey Brittney by Bey Shah out of Tanzeers Valentine) has also been well recorded in these pages. This has been a golden cross for Paul and Ria, with the first foals born in 2010. The chestnut Magnums Tulip and Marc’s Star and Magnums Rose, both bays, have been the poster girls for Knocke Arabians since they were foals. 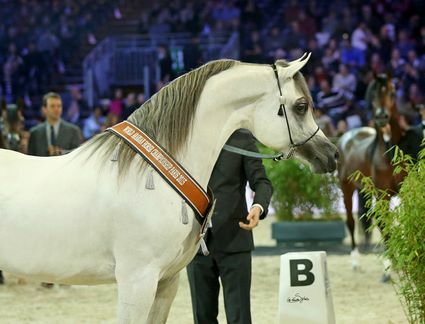 Indeed, Marc’s Star would become Knocke Arabians’ first homebred major title holder as she took the European Junior Female Championship in 2011, when just a yearling. Magnums Tulip was Gold Junior Female title at the 2011 UK International Arabian Horse Show, as well as Reserve Junior Female Champion at the Arabian Masters in Bordeaux, the St Tropez Breeders’ Cup and the West Coast Cup. Returning to the ring in 2015, she took home the Silver Champion Mare title at the Emerald Trophy. The 2013 colt Marius Madonna KA has regularly been placed at the top of the line in classes and in championships at shows across Europe. In 2015, he was awarded the Bronze Belgium National Champion title as well as the coveted Trophée Espoir at Menton, a prize awarded to the most promising European horse. Meanwhile, the 2014 filly, Magnolia KA was the 2015 Reserve Belgium National Champion. Looking away from this cross, the enchanting Penelope KA (ex Polonia by Ekstern out of Pasja by Wojslaw) was sold to Al Thumama Stud in Qatar. With them, she took the Gold European Junior Female Championship in Verona last year, winning her class and title with great aplomb. Others of note include Nadira KA (ex CN Neville by Delmar x AF Golena by Negorni), now a two-year-old filly who took many titles and wins in her yearling year, including the Belgium National Championship. Her full brother, the stallion, Newton KA, took the Senior Male title at the same show, to add to his many titles. This is a lovely line and there is more to come from these two horses, the beautiful and feminine Nadira especially. Finally, we have the darling of the show-ring and a personal favourite, the aforementioned Orfa D’Arab KA. This graceful six-year-old chestnut mare has won classes across Europe, including at the All Nations’ Cup and a phenomenal win in Paris, beating the great Wieza Mocy, who placed third. Orfa is feminine and refined, and it is hoped that she soon gets the titles that she so very much deserves. In Paris last November, QR Marc sired three class winners in Orfa D’Arab KA, Equiborn KA and Equator, which translated into two World Top Tens – Orfa and Wieza Mocy – and two Silver Champions, for Equiborn and Equator. With that, QR Marc took the Leading Sire Trophy, held for so long by his sire, Marwan Al Shaqab. With the next generation ready to make its way into the show-ring this year, it is hoped that this is a result that will be repeated. Congratulations to QR Marc – truly, the king of the world! A rising star in Europe, Equiborn KA has consistently turned heads since he first stepped into a show-ring as a yearling. Foaled in 2012, Equiborn offers a complete package as a show horse, and with his first foals being born, as well as his double Silver World Champion status, he is sure to be a horse that stays on many peoples ‘watch list’ as 2016 goes by. A son of QR Marc, Equiborn is out of Espadrilla, herself a daughter of the great Monogramm (Negatraz x Monogramma by Knippel out of Monopolia), a 1985 World and US National Champion stallion famed for his terrific movement and incredible daughters. Espadrilla’s dam is the ethereal Emanacja, sired by Eukaliptus (Bandos x Eunice by Comet out of Epigona), a daughter in turn of the Polish Mare of the Century, Emigracja (Palas x Emisja by Carycyn out of Espada). Emigracja was one of the most amazing horses ever to grace the Polish State Studs, and mares from this line are eagerly sought after. Truly bred in the purple, Equiborn brings together the great qualities of the QR Marc line with the Polish grace that only this ‘E’ line can. And the fact that, in just a few steps, Equiborn’s pedigree goes back to such greats as Bandos, Comet, Negatraz and so on all adds to his charisma. Equiborn KA was both a class winner and Silver Junior Male Champion in Paris last November. From the off, Equiborn has impressed. He is his sire, but in grey, and it was as a yearling that he took his first major titles. His first Gold came at the Emerald Trophy in 2013, and he followed this up with Silver at the West Coast Cup. A second place in Aachen surely paved the way for the Paris World Championships that year, where he took the Silver Yearling Male World title. A class win in Menton followed in his two-year old year, as did a Bronze World Junior Male title. 2015 saw Equiborn enter the ring as a three-year old and he took the Gold Junior Male Championship title in Chantilly and then Bronze at the All Nations’ Cup, Aachen. In spite of winning his class at the European Championships in Verona, Equiborn was unplaced in the championship. However, come Paris, his superior type saw him win his class and he would again take his third World Championship title in as many years, as he claimed a second Silver. Equiborn is now four years of age and is entering the senior classes this year. It will be interesting to see what happens next in his story, not least as his progeny are now also making their way into the show-ring. While none of us know what delights 2016 will produce for us all, one thing is for sure – this is a family that is making their mark on the Arabian horse industry, and I have a feeling that the best is yet to come. Equiborn KA in Paris 2015.